Will Olivia and Huntmaster remain at their lofty new prices? My bet for the archetype that would be performing the best at Grand Prix Charlotte and the card that would spike with it. One creature to rule them all. First off, we have a new queen in Jund. Olivia Voldaren saw some play back when the deck dominated the format, in an era when Birthing Pod was legal, but she wasn’t as powerful back then as she is today in a metagame full of grindy creatures and Lingering Souls. An unanswered Olivia takes over any creature-based matchup and she is not exactly easy to answer if deployed properly (a.k.a. with 1R open to grow her toughness to four in response to Lightning Bolt). Olivia was hovering at $6.60 when the Invitational concluded and spiked hard over the next few days to the $17.32 she is at today. Is her $17 price tag justified for a card that sees play as a two-of in the 75 of Jund and occasionally as a one-of in Grixis Twin‘s sideboard? My answer is yes. She is a mythic from Innistrad, which was opened nearly four years ago (how time has passed! ), so it’s probably about time that Olivia’s price hits double-digits as a mythic that sees Modern play. Olivia seems to be a trump card in grindy creature matchups and fits in any decks that runs BR and wants to grind out the long game. I don’t think $17 is the ceiling for Olivia if Jund continues to perform this weekend or if Grixis Twin starts to adopt her as a sideboard mainstay. On the other hand, Olivia is at most played in twos and that limits her price ceiling. I’d say $25 is the highest she could go in best-case scenario. The hunt is on again. We’re hunting fair decks this time. Huntmaster of the Fells is a wholly different beast. Like Olivia, Huntmaster spiked from the $6 to $18 within days following the Invitational. Remember, Jund made top eight of both the Invitational and Modern Open. However, I don’t think Huntmaster’s price is done spiking yet. While he was just found as a two-of in Jund’s sideboard, Huntmaster sees play in a larger variety of decks compared with Olivia. While Olivia’s role is to break open creature mirrors, Huntmaster serves as instant value in a format where removal is generally one-for-one. He is a bit like a planeswalker in the fact that he is a card that does multiple things: create board position, gains life, takes out small creatures, and domes the opponent. While Huntmaster can be found in a variety of midrange lists that runs his colors, his current surge in price is solely driven by Jund’s recent performance. While Delver decks went down the Grixis route to get access to the black Tarmogoyf, Kolaghan’s Command, and efficient creature removal suites resulting in an overall better midrange game, Jordan Boisvert took Delver down a whole different road. He shifted the deck’s gear to tempo and went full speed ahead. His version of Temur Delver plays the protect-the-queen strategy to the max. 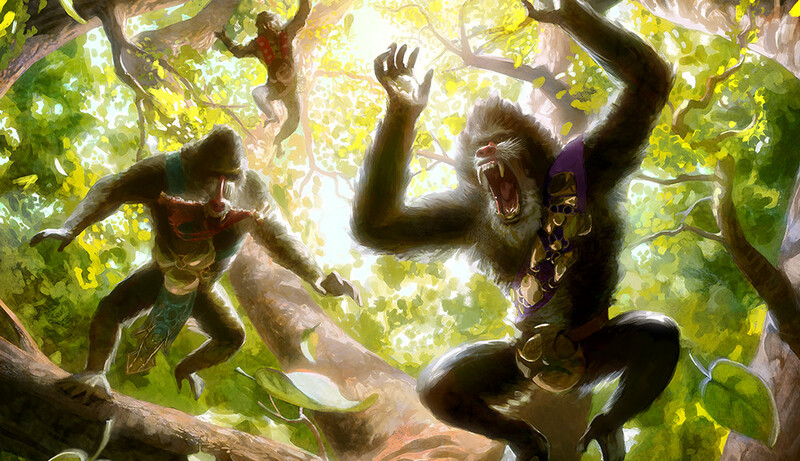 The playset of Disrupting Shoal protect your turn-one Delver of Secrets or turn two-Tarmogoyf or Hooting Mandrills. Stubborn Denial adds another three copies of an efficient counterspell to ensure the survival of your early, undercosted threats. 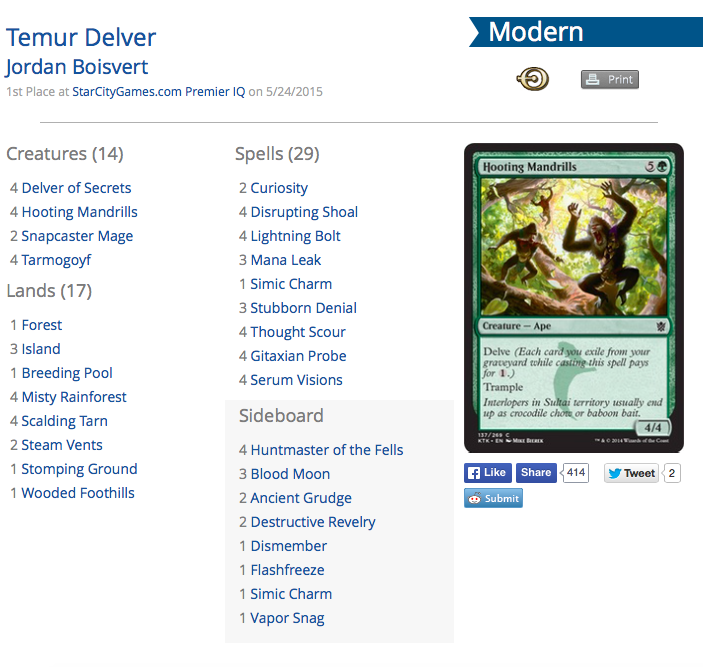 Instead of looking for an improved mid-to-long game capability, Boisvert’s Temur Delver just aims to deploy multiple undercosted threats within the first few turns of the game and protect them with highly efficient counterspells. Disrupting Shoal transforms card advantage into tempo, playing a similar role in Modern as with Force of Will in Legacy Temur Delver. With the most popular Modern removal spells costing one mana (Path to Exile and Lightning Bolt) and half the spells in the deck consisting of one-mana blue spells, there is no shortage of cards to pitch to Force of Will Disrupting Shoal. Jordan Boisvert’s write-up on how he came to the list and the decks choice of cards is well worth a read. In his article, Jordan mentioned that Huntmaster of the Fells excels in any matchups against fair decks. Based on his individual matchup analysis, Huntmaster seems to be brought in post-board the majority of the time, even against aggro decks like Burn and Affinity, against Grixis Delver, and even Twin decks in anticipation of grindy post-board games. The question now is: was the deck merely a one-hit wonder? Adam Fronsee, impressed with Jordan’s list, brought a Delver deck that runs the same core as Jordan’s Temur Delver list (delve creatures, Disrupting Shoal, and Stubborn Denial), but contains black instead of red, which gave him access to more Delve creatures and Abrupt Decay. His list was one of the best-performing decks in the Modern portion of the Invitational. Adam Fronsee finished 12th, probably let down by his Standard showing. Sultai Delver by Adam Fronsee. It looks like the pure tempo version of Delver running the Disrupting Shoal and Stubborn Denial core may be the next direction of Delver’s evolution. It’s hard for Delver to play the midrange game with Jund and Abzan doing it much better. The addition of powerful Delve creatures like Tasigur, the Golden Fang and Hooting Mandrills gave Delver more options for undercosted creatures, improving the archetype’s tempo game. The Modern Force of Will, Finally? Should Delver move towards a tempo-centric build, Disrupting Shoal would be the card that stands to gain the most price-wise. Finally fulfilling its destiny as Modern’s Force of Will? Disrupting Shoal is not the Force of Will that Modern needs, but the Force of Will that Modern deserves. Having dodged reprint in both Modern Masters, the supply of Disrupting Shoal is dangerously low. I dare not even posit its ceiling shall Delver decks move towards the Boisvert’s tempo core that runs a full four Shoals. 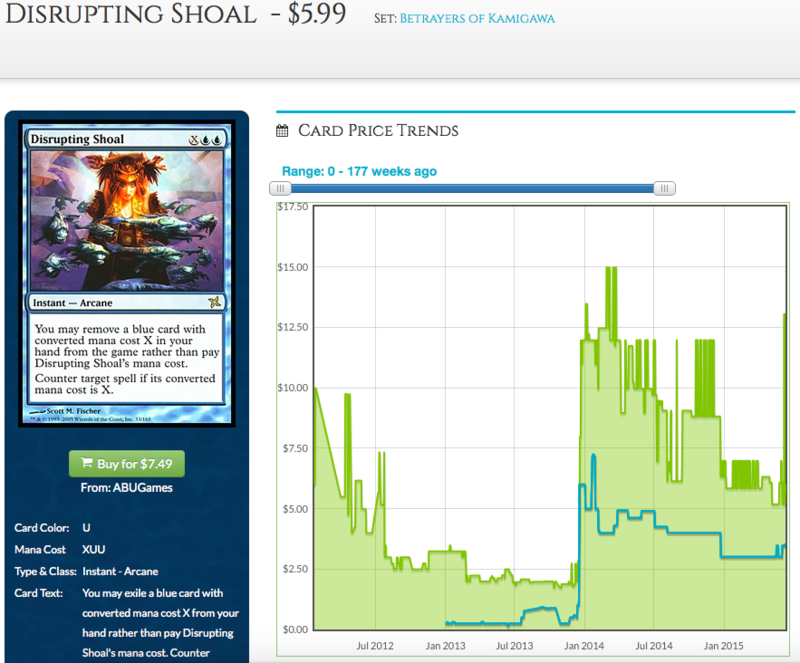 After a spike in January 2014 due to Travis Woo’s ephemeral Ninja Bear Delver, it is now back down to $6. I think it is a safe bet to buy in a this price, or at least pick up your own playset if you ever intend on playing Delver in Modern. One of the reason why I am bullish on cards related to new Delver tech is that Delver, be it Grixis, Temur, or Sultai, seems to be in a good position for Grand Prix Charlotte, assuming the metagame shifts in response to last week’s Star City Games Invitational and Modern Open results. At level zero, we could expect more Green-Red Tron decks, seeing that Green-Red Tron took down both the Invitational and Modern Open. Delver decks have a great matchup against any deck that attempts to resolve seven- and eight-mana spells. Temur and Sultai Delver probably just eat Tron for breakfast with their slew of undercosted threats that survive Pyroclasm. The Tron decks would probably eat up the fairest-of-the-fair Jund and Abzan decks. While Delver can handle Jund, Abzan is an atrocious matchup, so having to face less of those decks improves the odds for Delver. Luckily, Abzan is falling out of favor and players are opting for Jund once again, which is good news for the tempo-oriented Delver builds: no more Path to Exile and Siege Rhino, the best answers to Delver’s undercosted fatties. Abrupt Decay is plain useless against Delve creatures. At level one, we can expect more Twin and Infect, two natural predators of the Tron decks that can scarcely interact with them in game one. 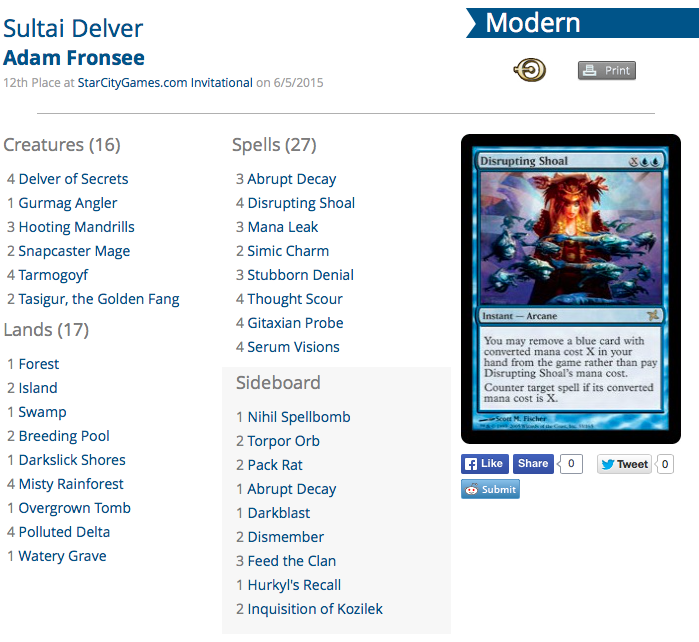 Delver has a favorable matchup against both these decks, as Boisvert explained in his write-up. Based on the above, I think there is a good chance we will see at least one Delver deck finally make top eight of a large event in the post-Treasure Cruise-and-Pod landscape. It’s hard to predict which build would be the one to make it all the way, but after watching Boisvert’s Temur Delver demolish the popular Grixis Delver in Jeff Hoogland and Mat Bimonte’s Crash Test series, I think the tempo-based Delver decks running Disrupting Shoal stand a better chance. After all, if Delver decks are king at the Grand Prix, the Delver that eats other Delvers would be emperor. Thanks for reading today. Do share your thoughts and predictions for Grand Prix Charlotte in the comments section below or catch me on Twitter at @theguoheng. Don’t forget Raging Ravine.. it’s spiking as we speak due to demand (I think). True to that. Every card that has to do with Jund seems to be spiking! Merfolk is on the rise in top 8 the past week and the low stock ob major sites suggests that it will see lots of play this modern season. It is an underrated deck that may come out in force this weekend. Very informative, Thanks! I’m not very familiar with Delver decks or Modern in general, so these articles that break down specific cards in new decks are invaluable. Always a good idea to stay ahead of the trend! Keep up the good work! Anyone can spit out price predictions but the way you break down your reasoning, match-ups and the Metagame involving your picks is truly professional. I think I’m going to have a second read and try to commit this “Delver” stuff to memory. I need to have a grasp on all this before I even think about speculating on Charlotte Top 8 results. I’m looking forward to your follow-up after results are in. Thanks for the kind words, really appreciate it 🙂 Thanks for the feedback as well, I am glad you’ve found this format of analysis to be useful. Perhaps I could tailor future pieces towards this style of analysis, seeing that I am invested in the strategy side as well being a primarily spikey player. I’ll certainly do a follow-up of GP Charlotte, regardless of whether my predictions came true.